Washington, D.C. (February 5, 2018) – After successfully converting a Silver Spring office building into new condominiums and following that with the approval of the first development project in Bethesda’s emerging Pearl District, Promark Real Estate Services, LLC jointly announced today that, with Vanguard Realty Group, they will combine two related companies into a single one to best serve the fast-changing real estate marketplace. The new Promark Partners unites the services of enterprising Promark Real Estate Services with veteran management company Vanguard Realty Group, two companion firms based in Montgomery County, Maryland. The new organization will produce a fully-integrated, private equity investment, development, ownership, leasing and management firm for a diversified portfolio of properties in and around the Washington, D.C. market. Before combining the two long-time firms, leaders of both companies collaborated to develop and manage an array of office and residential projects, hotels and professional buildings. The group recently earned attention for creating Octave1320, an office-to-condo adaptive reuse project in downtown Silver Spring, and for winning approval for the first development project in Bethesda’s Pearl District, next to the Bethesda Sport & Health Club, which the company also owns. Also on the group’s agenda is a new mixed-use development near White Flint Metro in North Bethesda, called East Village. 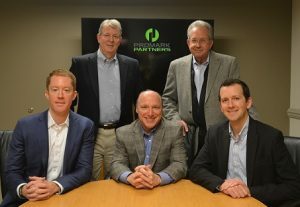 The newly minted Promark Partners will be headed by Thomas D.W. Fauquier and Robert O. Eisinger, who will serve as Chief Executive Officer, and Managing Member, respectively. They are joined by three other Principals: Robert L. Eisinger as Managing Director of Project & Asset Management, Peter McLaughlin as Managing Director of Development, and Gregory Klein as Managing Director of Commercial Leasing & Sales. A new Promark advisory committee, led by Chairman Sy Zuckerman, will be created to provide high-level, strategic guidance and leadership regarding the company’s future goals and initiatives. Headquartered in Rockville, Maryland, Promark Partners is a private equity investment, development, and management firm for a diversified portfolio of properties in and around the Washington, D.C. market. Founded by Robert O. Eisinger and Thomas D. W. Fauquier, Promark Partners has a long history of creative development and institutional quality leasing and property management services, along with well-respected civic engagement. Copyright ©2019 Promark Partners. All Rights Reserved.